Lint removers are simple tools with a very important job: to remove lint and fuzz from clothing. They are especially important for anyone who wears clothing that attracts a lot of lint or by people who own pets which shed. Without these tools, some of us couldn’t even go out in public without hair and fuzz all over our clothing. While some people may think that all of these tools are the same, we know that there is actually a difference between them that makes all of the difference in the world. That’s why we’ve decided to look for the ten best lint rollers and removers available. We’ve listed them below, along with a guide on properly removing lint from your clothing. Anyone looking for an inexpensive solution for removing pet hair, lint, dust, and dandruff from their clothing has to give this brush a good hard look. That’s because this easy-to-use tool does a great job at removing these unwanted pieces of fuzz from clothing. However, it’s not just designed to be used on clothes. It can also be used on bedding and upholstery, too. It’s dual-sided, so it can be used to pick up twice the amount of lint than conventional lint brushes. Another great feature is that it has an ergonomically designed handle that makes it easy to hold and use. All things considered, it’s a good brush for removing lint and fur. Whether you want to remove lint from your clothing or you want to restore old clothing by shaving the material that’s beginning to pile up on its surface, then this electric lint remover might just be the solution for you. It’s a product that plugs into a nearby electrical outlet, so you never have to worry if you have batteries on hand when using this tool. And since it has a 95-inch cord, it’s convenient to use in just about any room of the house. This product uses three stainless-steel shaving blades to efficiently and safely remove lint, fuzz and fabric pills off of sweaters, jackets, curtains, and upholstery. Effective and easy-to-use, this shaver is a handy tool for anyone to own. Is fabric piling becoming a real problem? Do you have problems with lint and fuzz clinging to your sweaters or upholstery? Well, if you answered yes to either or both questions, then you will probably want to take a look at this fabric shaver. That’s because it’s designed to handle both of these problems. All the user has to do is to plug in its electrical cord, and this unit is ready to get rid of lint, fuzz and fabric piling quickly and without damaging the fabric. Its 55-inch power cord makes it easy to move around the article of clothing while you’re shaving it and the unit comes with an extra blade for convenience. It’s a product that does a really good job at getting rid of fuzz and lint. 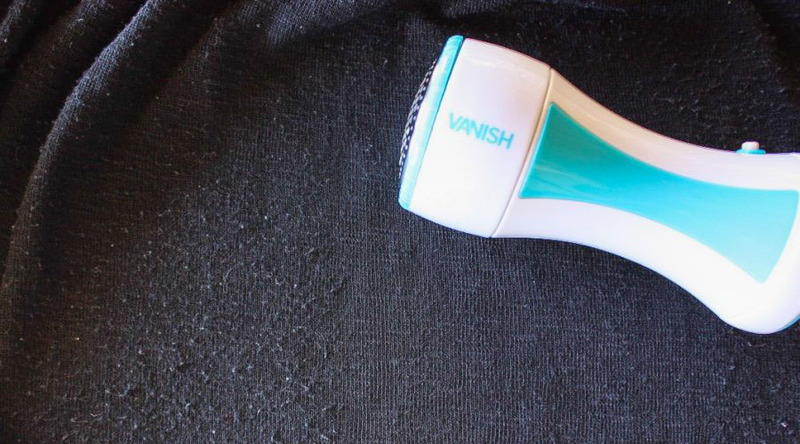 Getting rid of lint and fuzz from clothing can be a real pain, so it’s nice to have a clothing shaver that can remove these unsightly things from all of your clothes, upholstery, and curtains. It uses a 2.5-inch shaving surface to safely remove all of the pills, lint, and fuzz that’s been bothering you for so long. It has a nice, easy to hold handle that allows the user to move the shaver in any direction needed to eradicate fuzz. This product is so versatile it can also be used on carpets that are beginning to pill. Since it only shaves the top fuzz, it won’t damage the fabric it’s used on. And since it uses a power cord instead of batteries, it can be used anywhere with a compatible electrical outlet. No one has ever said that a lint roller has to be complicated and in fact, sometimes the simple solutions are some of the best ones. No product proves this particular point more than this Scotch-Brite Lint Roller from 3M. This product is the epitome of simplicity and only uses Scotch brand adhesive to quickly and effectively remove lint, pet fur, hair and other debris from clothing and furniture. And when it is completely covered in hair and can’t be used anymore, then all the user has to do is pull off the strip to start using a brand new one. This makes this a simple but effective tool in the fight against lint. This product is designed on a style of brush that’s been around for years now. The reason it’s been around so long is that it’s very effective at removing lint. However, while this model might be based on this particular style of lint brush, the manufacturer’s have added a feature that makes it even more useful. And that feature is a swivel head. This swivel head allows the brush to be used in a variety of different directions to remove pet hair, fuzz, and lint from all types of clothing and upholstery. It’s also reversible, so when one side is too hairy, the user can flip it over and continue to remove lint. The best part about this product though is that it can be bought as a single brush or in multi-brush packs. This product is based on a design that’s been trusted by dry cleaners and other garment professionals for quite some time. It’s a 2-in-1 device that can be used as both a lint brush and as a fabric shaver. This product can be used on a variety of fabrics including sweaters, coats, T-shirts, and hats. It can also be used on upholstery, bedding, blankets, and even car seats. Since it doesn’t have blades and isn’t powered, this product also won’t damage fabrics and is safe to use on everything from wool and cashmere to cotton, angora, and pashmina. It can even be used on synthetic fibers such as spandex, microfiber, and polyester. This battery-powered lint remover can be used on a variety of different fabrics and is designed to quickly remove lint, fuzz and animal hair. It provides 2-different speeds and 3-different shave heights, so it can be used on sweaters, upholstery, curtains, covers and just about anything else imaginable. Its special height spacer ensures that fabric isn’t snagged or damaged while it’s being shaved, and also protects the user’s hand from accidentally touching the blade. This shaver comes with a protective cap, a cleaning brush, and an instruction manual, so the buyer only has to insert two AA batteries into it, and they’re ready to get to work. This product is designed to remove pet hair better than any other product, and in that aspect, it truly succeeds. It doesn’t use batteries or any source of power to operate, yet is capable of picking up hair better than just about anything else. This lint roller also doesn’t use any sticky tape or adhesives in its design and contains all of the pet hair under its lid. When the user flips up the lid to this device, they can then quickly and easily dispose of the pet hair at their convenience. It’s manufactured with a durable ABS body and is as easy to reuse as it is to use in the first place. Anyone searching for the best lint remover available need not look any further than the Always Lux Professional Lint Shaver. This product is ideal for removing pills, bobbles, lint, and fuzz from a variety of different fabrics. It can be used on clothing, sweaters, blankets and even upholstery. Using a powerful 5-Watt motor and a 2.5-inch shaving head, it’s capable of making short work of most annoying lint problems. It uses both batteries and a power adapter and comes with a zipper storage case that can be used to store the unit when it’s not in use. Overall, this tool should be purchased by anyone looking to keep their clothing and furniture looking good. People have been searching for ways to remove lint from their clothing for decades. That shouldn’t be surprising since lint and fuzz can make a person’s clothing look really messy. Fortunately, there are some techniques which can be used to take care of the problem. The following are the best ways to accomplish the task of removing lint from all types of different clothing. Probably the best solution to this problem is the simplest one: the lint roller. This product has been used for a really long time and does a marvelous job at not only removing lint but also picking up fuzz and stray hairs (both human and animal). And the best part about them is they’re easy to use. If you’re using an adhesive-based one, all you have to do is pull off the tape and throw it away. If you’re using a velour type of roller, then simply run it under cool water or wipe it off with a wet rag. These devices are extremely easy and are either battery-powered or plugged into an electrical outlet, so they save manual labor. The best thing about these shavers is that they are easy to run across the fabric and are very easy-to-use. Cleanup is also fairly easy since all the user has to do is open the unit up and shake out the shaved lint. There are other methods of removing lint, of course, and I would be remiss if I didn’t mention them. However, just because the following methods are commonly used doesn’t mean that they’re effective. In our opinion, the best way to handle lint is by using a roller or shaver. With that being said, the following items can be used in a pinch. Rubbing one of these across some fabrics can remove some of the hair or lint that may be on it. While it’s not terribly effective and can be hard to manage, packing tape can be used to pick up lint in a pinch. You can wrap Velcro around a rolling pin and it works pretty decently. But the problem with this method is the Velcro often has a tendency of just coming off of the pin. If you have a clean, disposable razor you don’t mind ruining, you can always try to use it as a fabric shaver. It doesn’t work as well as an actual clothing shaver, but in some instances it may do the trick. A baby hair brush can also be used in some situations to remove lint and fuzz from clothing. Overall, some of the above methods are suitable for use in a pinch, but if you really want to be serious about lint removal, then your best option is buying a good lint brush, roller or shaver. These devices are designed only for the purpose of removing lint and fuzz, and as such, do a great job.